It’s also a very convenient way to eat heaps of greens that might’ve otherwise required more effort. There's no cooking, and barely any chewing. 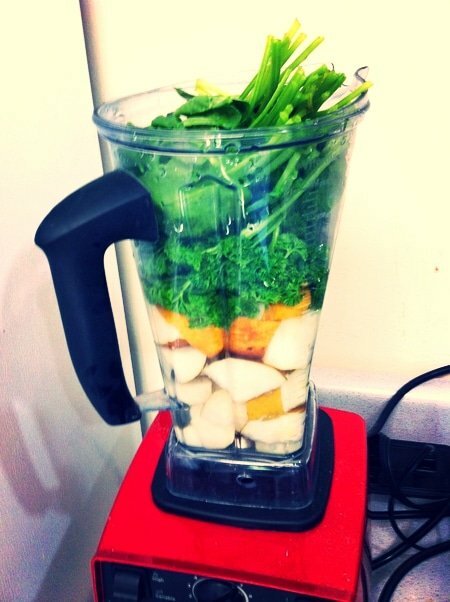 Just throw some really healthy stuff (greens) into a blender with some tasty stuff (fruit). Easy? Not quite. At least, it wasn’t for me, because I believed the only way to get maximum health points in my green juice was to add kale. A quick confession: I’m not really a fan. The grassy smell and strong flavor made my smoothies a chore, and by the time I’d loaded my blender with an obscene amount of fruit to mask the taste, I started to wonder if I had cancelled out the benefits. I was off the juice less than a week later. Don’t make my same mistake! We recently had chef Chaya-Ryvka (of Cafe Gratitude fame) in the office to give a talk about the benefits of raw food eating. She made us a green juice with parsley and pear that blew my mind, and it got me thinking, what else is out there? Then not a week later I ran into this list from the CDC of the most nutrient dense foods you can eat. The top 15 are all leafy greens and herbs, and 14 of those scored better than kale. Granted, I probably won’t add all these winners to my smoothies (sorry mustard greens). What Makes a Food ‘Nutrient Dense’? It’s important to note that what makes a food “nutrient dense” is the ratio between its caloric content and how many vitamins, minerals, and other health-boosting goodies you get (in 100 grams). Some foods are lower on this list because they have higher caloric values, (like kale which has 50kcal per 100 grams, vs watercress which only has 11kcal), even if they have more nutrients over all. That said, regardless of the specific order, all of these veggies are great for you. So I’m going to “rank” them by a different standard: flavor! For my fellow green juice newbies, the bitter taste averse, or anyone looking to try something new—get your mason jars ready! 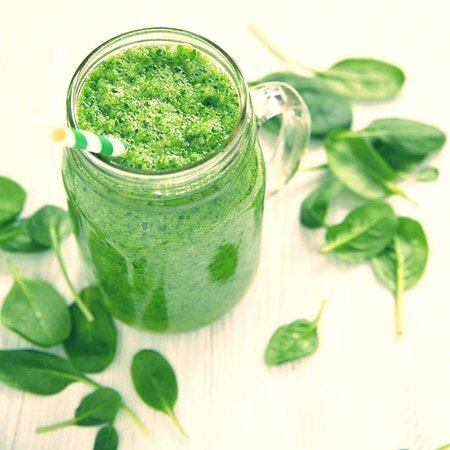 I’ve made a list of the most palatable and nutritious greens and herbs from this list that have rejuvenated my love of all things drinkable and green. And of course, that parsley and pear recipe is below! This light, leafy, and crunchy green is already a popular smoothie staple, for good reason. It has an amazingly neutral taste that goes with almost everything. Spinach also ranks 5th on this nutritional index, and is loaded with vitamins C, A, and K. That sounds like a win/win! Personally, I pack as many handfuls as possible into my blender. Even without fruit (just a bit of almond milk and natural sweetener), the result is a nutritious and bright green drink that’s super palatable. Yes, that’s right. Leaf lettuce is more nutrient dense than kale, according to CDC’s report. That is partly because of its mere 15 calories per 100 grams, but the important thing is that lettuce is much more nutritious than it often gets credit for. With a flavor that is incredibly mild, it’s also easy to add a lot to your drink. Just a cup and a half of shredded leaves boasts well over the Recommend Daily Intake (RDI) for Vitamins A and K, as well as solid amounts of Vitamin C, Folate, Calcium, Potassium, and Manganese. Parsley is third on this list, because while it isn’t bitter, it does have a strong, fragrant smell and flavor. That means it’s not easy to mask, and it may not work with everything. My advice: instead of trying to cover it up, take advantage of parsley’s herb-y, floral flavor by pairing it with sweet or tangy fruit (pear, apple, pineapple…). It’s also full of vitamin C, and great for cleansing the liver and kidneys. This leafy vegetable was a bit of a surprise because frankly, I thought it would taste pretty terrible. On the contrary, the flavor is like a (slightly) more bitter version of romaine. We blended half a head in the office, with just an apple and water, and it went down easily. This green also has over a hundred percent of your daily vitamin A, and nearly half of your daily vitamin C requirement. In terms of flavor, beet greens are slightly bitter (similar to chard), with very subtle “earthy” notes that are much milder than the root. If you're not a fan of this flavor, start with a few leaves to ease yourself in and you'll be surprised at how little it affects the taste of your drink. Beet greens are also highly nutritious, anti-inflammatory, and detoxifying for the body. One cup of provides 80% of the RDI of the antioxidant vitamin A, and a good amount of vitamin C.
According to the CDC’s report, this herb is number 1 in terms of nutrient density. This veggie is part of the cruciferous family along with other super foods including broccoli, cauliflower, and kale (their cancer-fighting benefits are “super” indeed). As for its taste, it’s light and surprisingly peppery, with a very “green” smell that’s strong and hard to mask. For that reason, green juice beginners might want to ease into this one. However, if you’re a seasoned juicer who’s getting a bit bored of the standard fare, Watercress should be on your to-do list. It’s a solid source of vitamins A, C, and K, as well as Calcium, Manganese, and Potassium! So there it is! Again, all these greens are excellent for you, so whichever you throw in your blender will be a good choice. I hope you find them fun to try (We did!). Lastly, for your enjoyment, I present the wonderful Dr. Chaya-Ryvka’s super simple Parsley and Pear Smoothie recipe. Her site is full of raw food tips, tricks, a recipes. I add spinach to my version (as you can see in the photo) to diversify the vitamins and give it a milder taste. The result is light in flavor, frothy, and a bit sweet. Yum! P.S. Looking for a blender to help you on your health journey? Vitamix is our blender of choice. You can get free shipping when you order through us! while perusing Facebook and drinking my green smoothie**, I came upon this great article, many thanks! I laughed when I saw your comment, ‘sorry mustard greens’ because I would have thought the same thing. However, I happened to be out of all other greens a few days ago and decided to give it a whirl. I make my smoothies with JJ Virgin’s protein shakes. I love the chai flavor and the mustard greens added a delightful extra bit of spice. Since then, I have used the mustard greens almost every day. So give it a try! Thanks, Sylvia! We’ll have to give that a try.